Something unusual happened this weekend, and I’d like to tell you about it. Everything started with this tweet, which I sent out at 12:22 PM on Friday, January 12. For several days, I’d been tweeting about the situation with Proud Mary. Sony’s Screen Gems division was working overtime to prevent critics from seeing the movie. There were no advance press screenings. Journalists attending the junket weren’t even allowed to see it — a highly unusual move. The now traditional “early showings” on Thursday night were cancelled, with theaters being told they were not permitted to show the film until Friday. There was also rampant speculation that Screen Gems was intentionally not marketing Proud Mary in an attempt to bury it. Here’s just one article positing that notion. Of course, I had every intention of reviewing the movie. It’s my job. 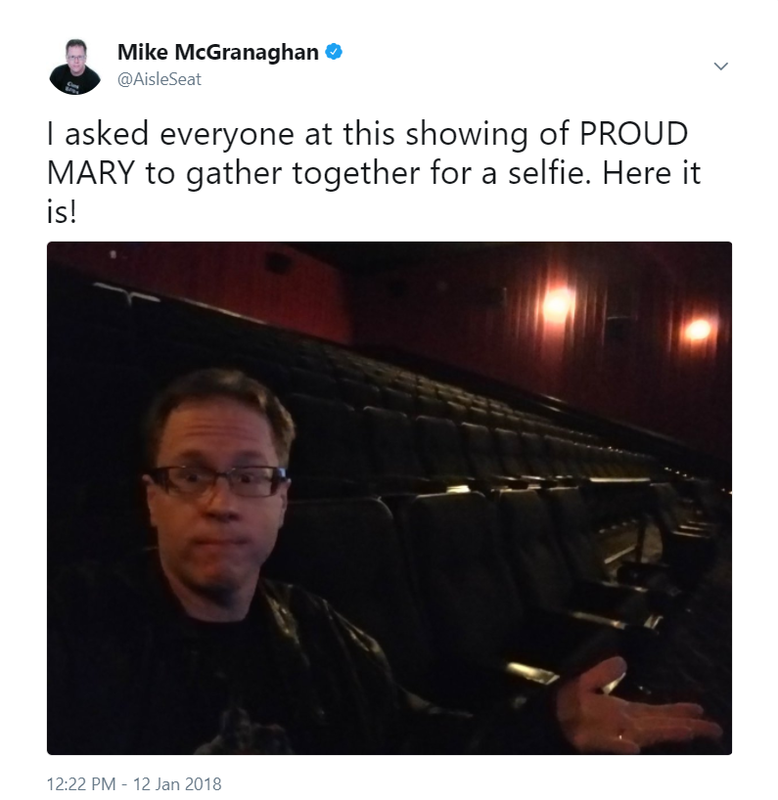 After getting to my local multiplex for the first public show on opening day, I was surprised to discover that I was the only person in a massive theater designed to accommodate 275 people. From my seat, I made a couple more tweets about the whole mystery surrounding the release, then posted that picture with the tongue-in-cheek caption just as the show was starting. It was, as I assumed any of my followers would recognize, a suggestion that perhaps there really was something to the theory that Sony’s lack of marketing would hurt the film. It’s what my string of tweets was building to. Well, for whatever reason, that picture went viral, meaning that a lot of people who don’t follow me and are unfamiliar with my work (or my sense of humor) saw it. At first, the reaction was as intended. People responded or retweeted with frustration that Sony didn’t seem to be giving Proud Mary much of a push. As the day wore on, the responses became more troubling. A number of people accused me of posting the picture in a direct attempt to “embarrass” the movie’s star, Taraji P. Henson. This was distressing. I’m a huge fan of Henson’s and have been ever since I first saw her breakout performance in Hustle & Flow. Given that Sony clearly didn’t want critics to see Proud Mary, it would have been very easy for me to skip it altogether. I wanted to cover it specifically because I am a fan of hers. I was pulling for the movie to be good. Trying to embarrass an actor I like — or any actor, for that matter — simply isn’t a move that I have in my playbook. One girl tagged Henson on my tweet, apparently hoping the actress would see what I’d posted. I told her such an act was tasteless and cruel, and asked her to delete it. She refused. Then came multiple accusations of flat-out racism. There are really only two ways I could respond to the backlash I received. One would be to get defensive about it, the other would be to listen. I’m choosing the second path — or at least trying to. So if my goal is not to be defensive, why am I writing this post? I’m writing it because this was eye-opening, and I think anyone who writes about film — whether for an official publication or simply their own Twitter feed — can learn something here. I sure did. All of us are capable of thinking inside a bubble. We do it all the time without realizing it. From my perspective, I approached Proud Mary as a probable dud the studio was hoping to keep the lid on. I see at least a dozen of those every year. Put another way, it was an assignment, one of at least 150 movies I’ll review this year, albeit one with somewhat mysterious circumstances surrounding its release. Through Twitter, I came to realize that, for many others, it’s far more than that. It is groundbreaking in a culturally significant way, offering representation that Hollywood shamefully offers far too infrequently. Big difference there. My way allowed for a pithy remark. The other way makes pithiness insensitive. I have tweeted pictures of myself in empty theaters before. Proud Mary perhaps was not the correct film to do this with. At the very least, I wish I’d captioned it differently. “Could Sony’s lack of marketing be doing the trick? There sadly is no one else here for the opening day show of Proud Mary” might have been more effective. Or “I hope other theaters are fuller than mine, because — good or bad — we don’t see movies like Proud Mary come along very often.” Both of those sentiments are more reflective of my views than the remark I wrote. Although it wasn’t my intention to embarrass Taraji Henson or mock a big studio movie that cast a black actress in a lead action role, I now fully understand that it might have looked that way removed from the context of its surrounding tweets. All of us who write professionally about film should try to be cognizant of how we frame the individual titles we’re covering. Whether we love them or hate them, there may be more depth to the public perception of them than we automatically realize. And if our goal is to serve the ticketbuyers, we need to keep that in mind. I failed to foresee what Proud Mary might mean to many moviegoers, and I regret that. My goal is to provide useful commentary and analysis to anyone who sees something I’ve written, be it a full review or a mere social media post. Love it, hate it, or fall somewhere in between, how great is it that a mega-talented actress like Taraji P. Henson is getting cast as the lead in a major studio action movie? Pretty great, I think. Here’s hoping pictures like this become more common.